Before the modern days of noisy powered ships, sailors regularly reported encounters with sea monsters. See the Dragons in History page. But even today rumors persist of sea serpents and large plesiosaur-type creatures living in the ocean depths. Probably the most-respected “sea serpent” story involves the Cadborosaurus (“Caddy”) which has been observed numerous times off the coast of British Columbia. Native peoples of the Pacific Northwest memorialized important animals in rock carvings. The petroglyph on the top right is from the Nanaimo Petroglyph Park. 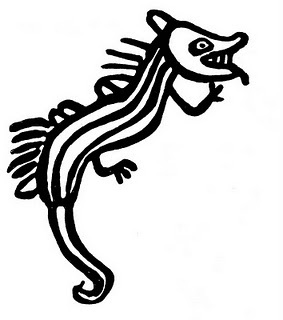 The lower one is traced from a large rock near Sproat Lake on Vancouver Island, British Columbia (Drawing after Indian Rock Carvings, by Beth Hill, Hancock House Publishers, 1980, p.22.) 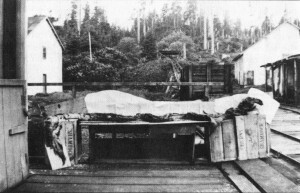 On November 22, 1934 a report came out of Prince Rupert: “The remains of a strange marine monster thirty feet in length resembling the description of sea serpents which have been previously reported in British Columbia was brought here from Henry Island by Dr. Neal Carter, director of the Prince Rupert Dominion Fisheries Experimental Station. The body was so badly decomposed it was impossible to preserve it intact.” (Gaal, Arlene, In Search of Ogopogo, p. 85.) In 1947 a snakelike creature was found by four fishermen wedged between two boulders off the British Columbia coast. The skull was one foot wide and resembled a horse or camel. A young Caddy was allegedly captured by Captain Hagelund, a retired whaler who was yachting in Pirate’s Cove, DeCourcy Island. Towards evening they saw a disturbance in the cove and managed to net an eel-like creature with big eyes, a hooked snout, sharp teeth, flippers, and a spade-like tail. Hagelund examined the creature, drew a sketch (upper left) and then released it out of pity. 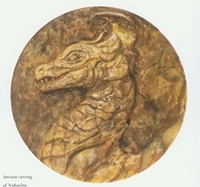 (LeBlond, and Bousfield, Cadborosaurus: Survivor from the Deep, 1995, p. 57-59.) Professor LeBlond of the University of British Columbia presented a paper giving a formal description of the Cadborosaurus willsi to the Canadian and American Societies of Zooloogy based on photographic evidence. He cited a 3-meter carcass of an apparent juvenile that was discovered in the stomach of a sperm whale as proof that the sea serpent exists. 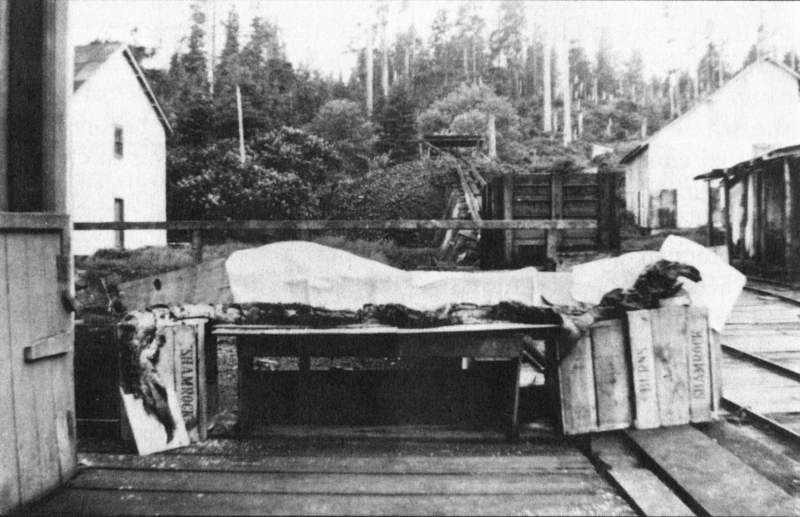 The photo of this corpse (shown right) is courtesy of the British Columbia Scientific Cryptozoology Club, copyright 1995. 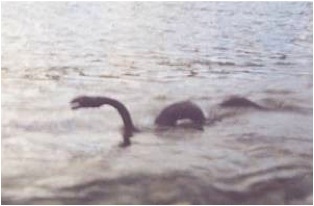 The Great Lakes in north America have had more than their fair share of sea monster stories, including a photo of “Bessie” taken in 1991 by John Kraft. Not to be outdone by their friends in Scotland, the Irish have reports of a eel-like monster called Pieste. Some of the larger bodies of water (like Lough Fadda, Ree and Nahooin), have been investigated after monster reports surfaced from credible witnesses. Then there is Memphre, the mysterious creature of Lake Memphremagog, on the Vermont-Quebec border that has been observed since the 1800s. What has been reported as a plesiosaur has also been repeatedly sighted in Bynoe Harbor near Darwin, Australia. It is said to be depicted in Aborigine cave paintings in the north. 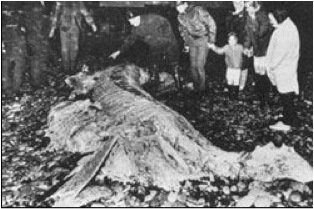 The corpse pictured to the right washed ashore on Mann Hill Beach in Plymouth, MA during November of 1970. Described by one eyewitness as a “camel without legs” this carcass has confounded investigators for decades. It was said to be about 20 ft long, weighing approximately 2 tons and closely resembled a plesiosaur. Reports surfaced in the mid 1990s of a monster in Lake Van, a large alkaline lake in eastern Turkey. In 1997 Unal Kozak took an amateur video of the creature, which is purported to be over 40 ft long and sports spikes down its back. There are now over 1,000 eye witnesses claiming to have seen the plesiosaur-like beast! Other speculative stories about USO’s (Unidentified Swimming Objects) abound from England, Iceland, Sweden, Russia, France, and Japan. Could some of these creatures be plesiosaurs as well?